Upcoming Free Bullying Prevention Event for 5-8th Graders in Long Beach, CA — Saturday, October 17! 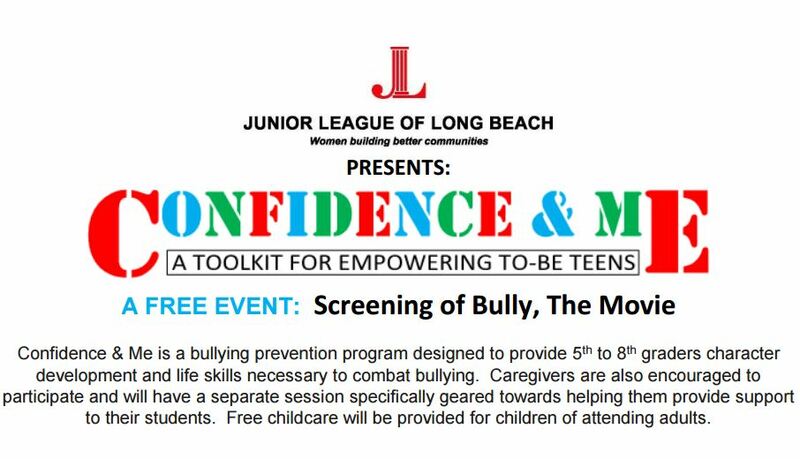 The Junior League of Long Beach is hosting the first FREE Confidence & Me: A Toolkit for Empowering to-be Teens! of the year on Saturday October 17, 2015 from 9:30am to 2:00pm at Lindbergh Middle School in Long Beach, California. This workshop will be part of the month long community discussion on Bullying. All 5th-8th graders and their caregivers are encouraged to attend! The workshop will include a screening of the documentary film Bully (2011). Following the movie will be lunch and an empowering activity led by Power of One Self Defense of Long Beach. During the afternoon, the adults and students will be separated into different groups to learn more about bullying and how to empower students to stand-up and change the culture of bullying in our community. RSVP is required and the event attendance will be capped. Please contact community@jllb.org or click “Confidence & Me” for more information! The Junior League of Long Beach is building upon the success of Especially Me! and expanding to working with community partners in Long Beach to combat bullying through character development and life skills programs for 5th-8th graders and their caregivers that encourage relationship building and respect for self and others. Please click the following link for the Confidence & Me Flyer with RSVP Info. We ask you to please share this with anyone you know who would benefit in participating and/or attending. This entry was posted in Bullying Prevention, Leadership, Self Esteem and tagged #antibullying, #bethechange, #bullyingprevention, #bullymovie, #california, #community, #confidenceandme, #empower, #la, #leaders, #longbeach, #longbeachcity, #losangeles, #middleschool, #positiveselfesteem, #selfesteem, #students. Bookmark the permalink.